A three-day national seminar which is first of its kind in the north-eastern region, on ‘Strengthening of seed system in the Northeast and unreached regions – problems, prospects and policies’ is underway at the Jubilee Hall of Regional Institute of Medical Sciences in Imphal of Manipur. 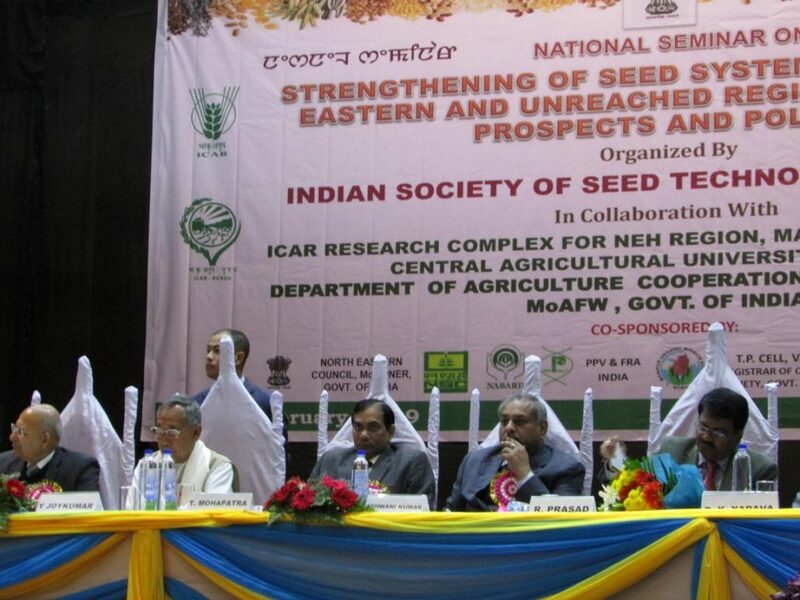 The seminar which aims to create a new mechanism to produce and provide quality seeds including the organic one for the progressive agriculture system in regions such as the Northeast has been organized by Indian Society of Seed Technology (ISST), New Delhi in association with Indian Council of Agricultural Research (ICAR) Complex for North Eastern Hill Region, Manipur Centre at Lamphelpat and Central Agricultural University (CAU), Imphal besides the Department of Agricultural Cooperation & Farmers Welfare (DAC), New Delhi. Most of the resource persons sharing their observation at the seminar on its second day on Monday emphasized on the need for a strong seed improvement programme that can make agriculture more viable, profitable and sustainable while some of the experts suggested to develop some region specific quality seeds centre for the region. On Monday, the experts and concerned stakeholders mainly discussed the knowledge and skill development in seed science and conservation of biodiversity and plant variety protection besides seed industries. Low availability of skilled human resource, limited market preference and profitability are also some factors that need to be addressed, felt the experts. The seed system in the north-eastern region and unreached regions is weak and inadequate to meet the demands of these States, due to several factors such as limited scope for seed production of many crops with unsuitable agro-climate, modest crop wise seed requirements of each State to meet their own statutory requirements under Seeds Act etc. In fact the ongoing seminar attempts to bring together the seed scientists, extension personnel, policy makers and seed industry leaders of the country as well as farmers, to discuss new research breakthrough, novel seed technologies, seed policies suitable for the regions, problems and opportunities in the domestic and export markets and to share and exchange new ideas. Chairman Dr R S Paroda of Trust for Advancement of Agricultural Sciences, New Delhi, was conferred Ch Amir Singh Memorial Award at the event. Deputy chief minister Y Joykumar Singh, chairman Dr R S Paroda of TAAS, secretary Dr Trilochan Mohapatra of Department of Agricultural Research and Education and Director General ICAR New Delhi, joint secretary (Seeds) Ashwani Kumar of Department of Agricultural Cooperation, vice chancellor Prof M Premjit Singh of CAU Imphal, president Dr Malvika Dadlani of ISST attended the inaugural function of the event on Sunday. A souvenir was also released as a part of the seminar.